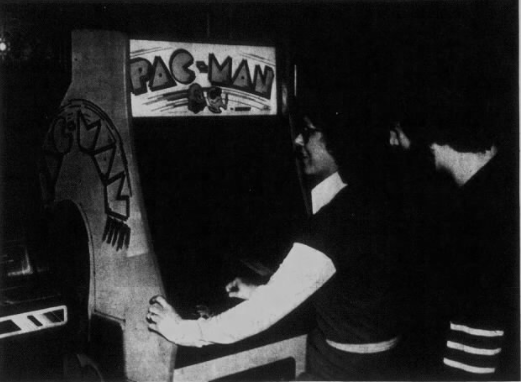 The number of quarters I poured into Pac Man machines back in the early 80s is both thrilling and shameful. I remember grabbing the cabinet like this. Fun article on something I'd never even thought about before. Thanks for posting! I really enjoy DeSpira's work. Although I don't remember doing this with my left hand in particular, it might be because, for some reason, I mainly just saw cocktail table Pac-Man games when I was growing up. I don't know why that was. (I even knew somebody who had one; she didn't seem rich, but I was in awe.) I always thought of the arcade stance as being particular in a different way -- leaning in, one leg straight, one knee crooked forward with the heel off the floor as the player shifts their weight back and forth during the game. The picture captioned "Woman awkwardly ..." interested me immediately because that is a lady of business. She has glasses, a purse, a suit, no-nonsense hair -- she's in her late twenties, if not older, and she's down in the arcade just as she has every right to be. I love it. Reminds me of the Atari Football I played recently -- most of the game is rolling this massive trackball as fast as you can with both hands, and the cabinet takes a few hits in the process. This kind of physicality is just impossible to capture with emulators, and now I want to visit ACAM. This feels like it should be part and parcel of some general curatorial wisdom: that patterns of wear form an integral component of an item's provenance, and that any sort of "restoration" needs to respect that aspect. I'm curious what sort of standards museums apply to the restoration and reconstruction of damaged and heavily used artifacts, with regard to balancing the presentation of the object "as it should be" versus "how it became through use and abuse". I’m just amazed at the banks of several cabinets of the same game. I guess it makes sense, with how popular Pac-Man in particular was, but I don’t recall ever seeing more than two games right next to each other like that. I saw large banks of racing games right up through the later nineties. Sometimes that had to do with multiplayer capabilities but not always. Even today you can find 5+ Street Fighters at a bigger arcade, but they are usually 2-5 different versions. 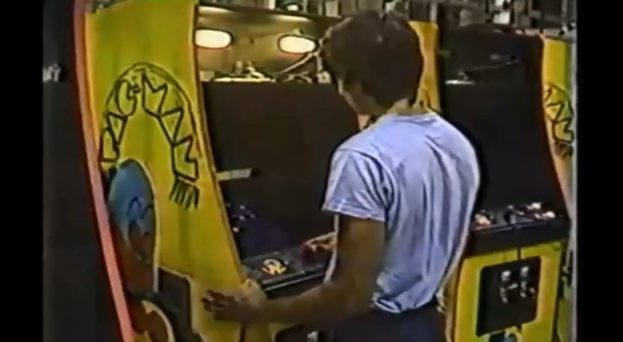 I remember seeing photos of 1970s arcades with nothing but Space Invaders cabinets. Another cool thing is this Myrtle Beach penny arcade with a whole lot of mechanical Williams baseball games. It’s an interesting phenomenon, and a fresh angle the game’s history. But it’s weird to see Billy Mitchell after his ban from competitive play. I was never any good at pac man (or any other video game) but I can remember having one hand on the edge like in the photos. Pac-Man is the only arcade game I remember seeing people get in lineups to play. I also remember roller skating to "Pac Man Fever" (the rink also had an arcade with Pac Man, so we're approaching Peak Early '80s here). 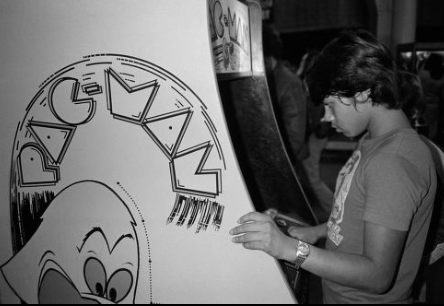 I was never a big Pac-Man fan, but of course I played it, and I can't remember whether I did the left-hand grip thing or not. I probably did. And now that I've read the article, I can never find out. I was never a big Pac-Man player, but this really speaks to my experience as an early-80s arcade kid. A couple of weeks ago, I went to an event at a barcade in SF, and I got a chance to spend some time playing one of my favorite games ever - Galaga. And I discovered that I still, instinctively, stand in a specific "Galaga" stance - left foot jammed up against the base of the cabinet, right foot behind me about 25 degrees and pushing me forward, leaning into the cabinet space. This is very different from, say, the "Spy Hunter" stance, which has the left foot backwards for balance, right foot on the gas pedal, standing straight upright instead of leaning forward. I loved this article. There's a barcade near me, 5 bucks to get in, machines all on free play. IT's a great joint but it's packed with machines and each one has a different optimum comfort space. We found ourselves leaving games for others when there was an easily attained position to play the cabinet in, never consciously thought about how important that sort of thing was until reading this.